The software I mostly use on Linux is Vokoscreen, never had a problem with it and works like a charm on Linux Mint, Ubuntu and Mageia. But on Fedora, it's a different story. I tried google in it, but I get no answers, not to mention the error message doesn't give me any warnings or information to what's wrong or if I need some extra libraries. I tried uninstalling and installing Vokoscreen from different methods:Terminal, downloading the RPM file, using older versions, but everything ends in the same result. I tried using VLC which crashes when I try to record and GTK recordMyDesktop is a piece of junk that get's stuck in the same frame for the duration of the video. 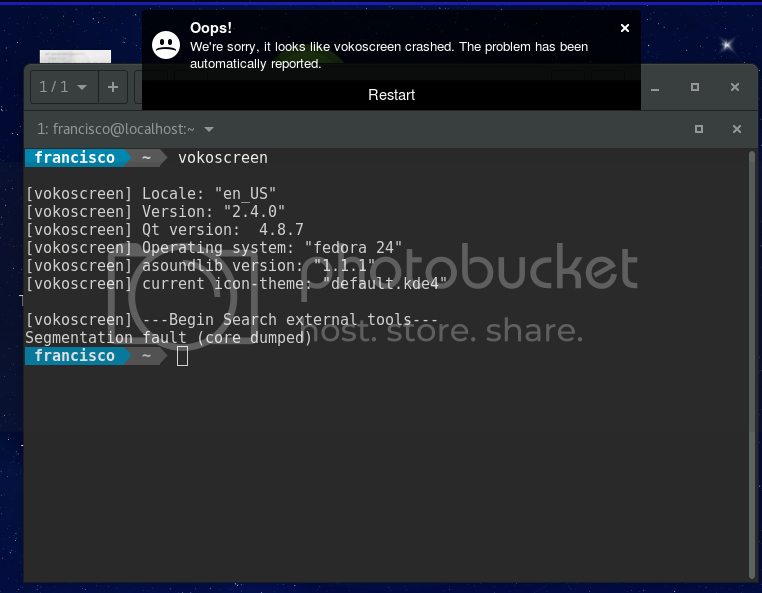 EasyScreenCast worked like a charm on Fedora 24, but after I downloaded and installed the first OS updates it stopped working, yes I tried going to the Gnome extension site and disabling and enabling it again but still doesn't work. I can still go to the Options tab and all the buttons work, but when I click on 'Start Recording' nothing happens. How do I get at the very least Vokoscreen or EasyScreenCast to work once again? dnf.exceptions.Error: Will not install a source rpm package (vokoscreen-2.4.0-1.fc24.src). I opened a bug report on RPM Fusion https://bugzilla.rpmfusion.org/show_b... , see you there. vokoscreen-2.4.0-1.fc24.x86_64 works in my vm F24 . [vokoscreen] Operating system: "fedora 24"
[vokoscreen] Search ffmpeg ..... found "ffmpeg" Version: "3.0.2"
[vokoscreen] Search pactl  ..... found Version: "8.0"
[vokoscreen] "Display 1:  1280 x 710"
[vokoscreen] runs on DISPLAY ":0"
[vokoscreen] Find Videoplayer : "/usr/bin/kdenlive"
[vokoscreen] Find Videoplayer : "/usr/bin/smplayer"
[vokoscreen] Find CaptureCard: "[hw:0,0] Intel 82801AA-ICH"
[vokoscreen] Find CaptureCard: "Monitor of Áudio Interno Estéreo Analógico" with device: "alsa_output.pci-0000_00_05.0.analog-stereo.monitor"
[vokoscreen] Find CaptureCard: "Áudio Interno Estéreo Analógico" with device: "alsa_input.pci-0000_00_05.0.analog-stereo"
[vokoscreen] Executive command : "/usr/bin/ffmpeg -report  -f x11grab -framerate 25 -video_size 1278x708 -i :0+0,0  -pix_fmt yuv420p -c:v libx264 -preset veryfast   -q:v 1  -s 1280x710 /tmp/vokoscreen-vokoscreen/vokoscreen-2016-07-29_23-58-29.mkv"
[vokoscreen] Executive command : "/usr/bin/ffmpeg -report  -f x11grab -framerate 25 -video_size 1278x708 -i :0+0,0  -pix_fmt yuv420p -c:v libx264 -preset veryfast   -q:v 1  -s 1280x710 /tmp/vokoscreen-vokoscreen/screencast-pause-1.mkv"
[vokoscreen] Mergestring : "/usr/bin/ffmpeg -report -f concat -i /tmp/mergeFile.txt -c copy /home/sergio//vokoscreen-2016-07-29_23-58-29.mkv"
[vokoscreen] Executive command : "/usr/bin/ffmpeg -report  -f x11grab -framerate 25 -video_size 1278x708 -i :0+0,0  -pix_fmt yuv420p -c:v libx264 -preset veryfast   -q:v 1  -s 1280x710 /tmp/vokoscreen-vokoscreen/vokoscreen-2016-07-29_23-59-56.mkv"
Yes it's 2.4.0 and it doesn't work. hello i have the exact same problem. I installed vokoscreen from terminal , I get the same output in my terminal. I realized that ffmpeg is not yet installed. And this make a new question , how to know all external tools for my applications? How do I do that? su dnf remove ffmpeg? Can I make my display settings persistent?